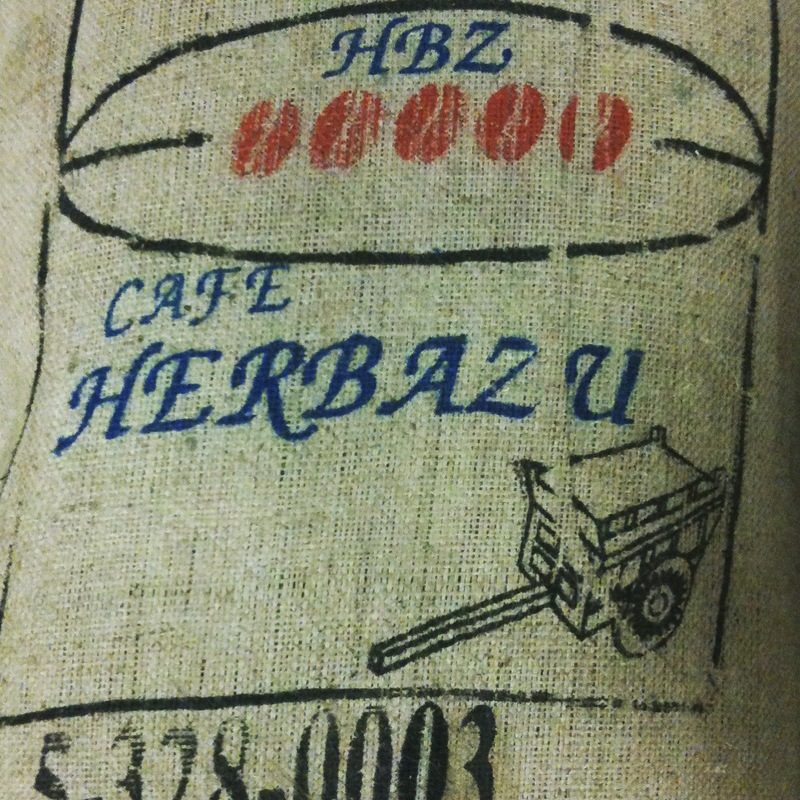 Five years ago to this month we were roasting our very first espresso blend, a 60:40 mix of Fazenda Passeio from Brazil and Cafetalera Herbazú from Costa Rica. I remember launching it to an unsuspecting Cumbrian population and the initial positive, but surprised, feedback we received. So many people we unaware that coffee could produce such flavour, and were equally surprised by the lack of bitterness in the finish. We worked extremely hard on that first blend, a work ethic we have applied to each subsequent version of our espresso blend, in order to ensure it met the high standards we had set ourselves. Five years on, and we’re about to launch the latest version of our blend. We’re revisiting the same origins as our original blend, and although we’ve not quite managed to source the same farms, we’ve stayed true to the 60:40 mix. From Brazil we’ve chosen Fazenda Capim Branco and the Costa Rican component is shared between Finca La Manzana and Hacienda Sonora. Our intention as a coffee roaster is to harness the origin characteristics and flavours in our roasting, and while this is as true today as it was five years ago, the way in which we set about achieving this has changed a lot. We were very fortunate in our early days to receive a lot of advice and support from some key figures in the coffee industry. Will Corby, our account manager at Mercanta, our coffee brokers, gave us some sound advice on the coffee for our initial blend, and we will always be grateful to James Hoffmann and Anette Moldvaer of Square Mile for their advice, support and feedback on those early roasts. The choice of components for that initial blend was very much down to the aforementioned people. Our approach to roasting was very simple: roast a batch, taste it and if it wasn’t good, roast it again. On reflection the use of the word ‘good’ in the previous sentence probably does us a disservice as we set ourselves very high standards. Over the years a number of batches of roasted coffee have never made it into bags having failed to meet the Carvetii quality standard. In the early days this was particularly painful as a batch of coffee is worth a decent amount of money but there was no way we were selling a below par batch of coffee! The responsibility for roasting was very much shared by the two of us, with both of us huddled over the (sensitive) burner controls, probably more out of a desire to get warm than anything else. There was much debate as we watched and listened to the roast carefully, with time, temperature and other comments meticulously recorded in a note book. We’d had the foresight to equip our roaster with a digital probe so we had a precise reading of drum temperature throughout the roast. While I recording of temperature and time was undertaken with precision, the documentation of burner setting was less so – I distinctly remember terms such as ‘a quarter turn clockwise’ being used. Our desire to record the stages in roasting was not only to learn more about the art through a ‘cause and effect’ approach’ but also to ensure we provided our customers with a consistent product. We both had numerous years in the hospitality industry under our belts and knew that consistency would be one of the key elements to our long term success. Some of the items in that first notebook we a precursor of things to come; on some of the early pages I recently came across some density calculations which were an initial attempt to determine the density of the green beans using techniques I’d learnt in school. How our coffee tastes has been important to us from the outset and each roast was carefully analysed for flavour. 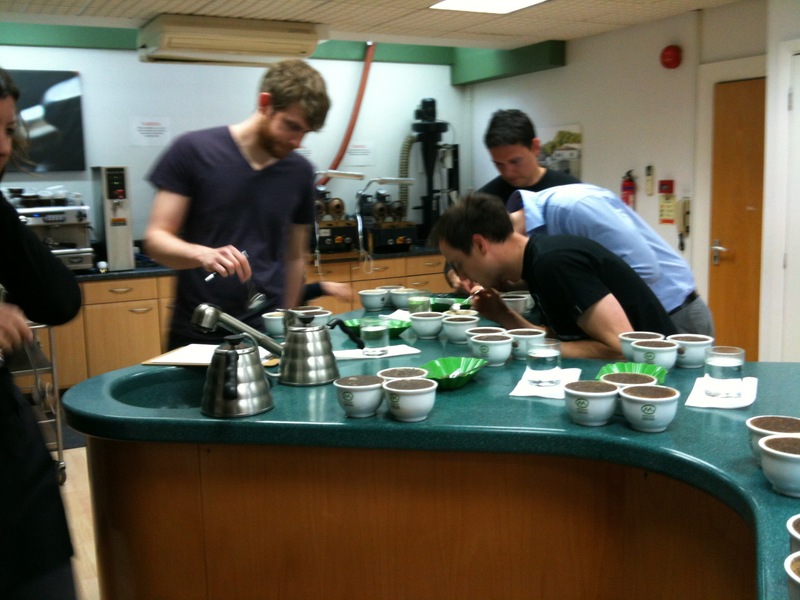 Samples were kept from every batch and we spent a long time tasting our coffees. Initially we cupped the coffees to gain an insight into the flavours and their character but we also tasted them as an espresso, which is how we expected the coffees to be used. At the top me we knew how important the grinder was in this process so we splashed out on a Mazzer Major grinder, leaving little money left for an espresso machine. Luckily our friends at Square Mile stepped in and loaned the a La Marzocco GS3 single group espresso machine. It became apparent from the outset that each of us brought something different to the table when it came to tasting the coffees. Angharad had the ability to quickly identify fragrance, aroma and flavours in the coffee, a skill which even today remains a dark art to me. I have always been able to identify flaws in the roasting, and from the outset adopted a very critical approach. Five years on, and while our ethos and beliefs have remained constant, the way we approach our roasting has evolved. ‘Evolved’ really is a good fit in this instance as we have developed our skills over time, continually pushing ourselves to learn more, and to adapt this learning to suit our circumstances. What our roasting looks like now is for part 2 of this blog post. Previous Post Complain or Not Complain?